The Ridgewood Guild strives to make downtown Ridgewood, New Jersey, an enjoyable place to shop, dine, and visit, hosting events, movie nights, art shows, festivals, and more throughout the year. Brianna of Crearé Web Solutions serves on the Guild’s board and was intimately familiar with the organization’s goals. 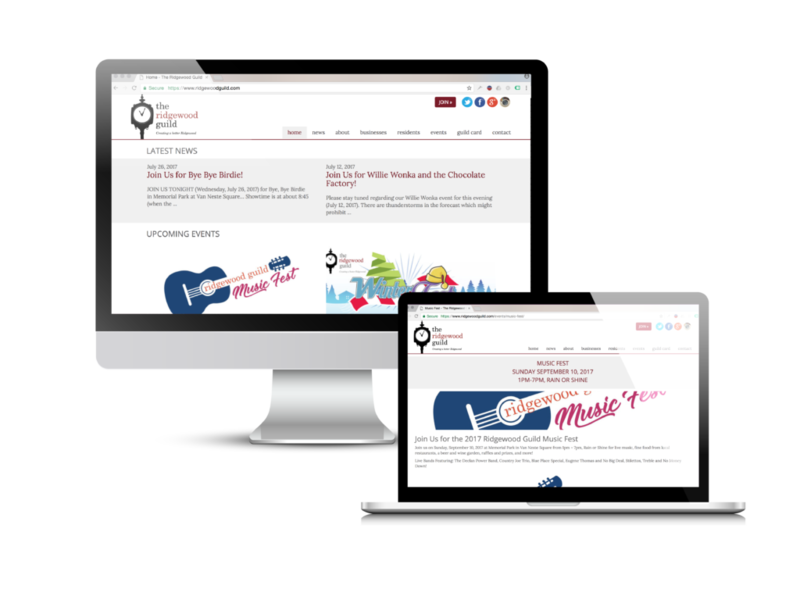 The Guild needed a website to share information about events and opportunities for volunteers and members and also to make the online membership application and payment process easier and more secure. Crearé Web Solutions worked through a web development plan with the board members of the Ridgewood Guild to ensure that the new website would meet all its needs and serve the Guild well for the foreseeable future. We made it easy for board members to create event pages that automatically reorder based on event date and created backend functionality to house important member and other data. To make the member portal more useful, we built a payment portal so that members’ accounts are always updated. Now, members are reminded to renew their accounts (automatically or as requested) as their dues lapse. The new Ridgewood Guild website is clean, easy to navigate, and welcoming for new and returning visitors. The site is the hub of events and other information for the community and brings efficiency to the operations of the Ridgewood Guild.